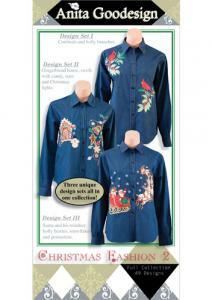 This is our second collection of Christmas designs that are specifically designed and sized for clothing. The designs are light and fashionable and can be used on any type of garment. Of course, they also can be embroidered on quilts or any other item you may want to decorate your home with. The collection consists of three different themes with over a dozen designs in each theme. The first theme is cardinals perched on branches of holly berries. The project we created for this theme is a classic denim shirt with two large embroideries on the front of the Cardinal designs. Then we embellished the shirt with crystals to add some glitter! The second theme is a Gingerbread man and house. We created the gingerbread man, a star, bell and gingerbread house as applique designs and they are stylized to look great on garments. Then we created gold swirls with candy, stars, and Christmas lights for more design choices. We embroidered this group of designs on a denim shirt. The third theme is Santa and his reindeer. This design lines up perfectly across a denim shirt as you can see on our sample. This theme also includes small holly leaves and poinsettias that could be added to the collar or sleeve. As you can see, you will find many uses for the Christmas Fashion 2 collection whether you are decorating your garments or your home! Gingerbread house, swirls with candy, stars and Christmas lights. Santa and his reindeer, holly berries, snowflakes and poinsettias.